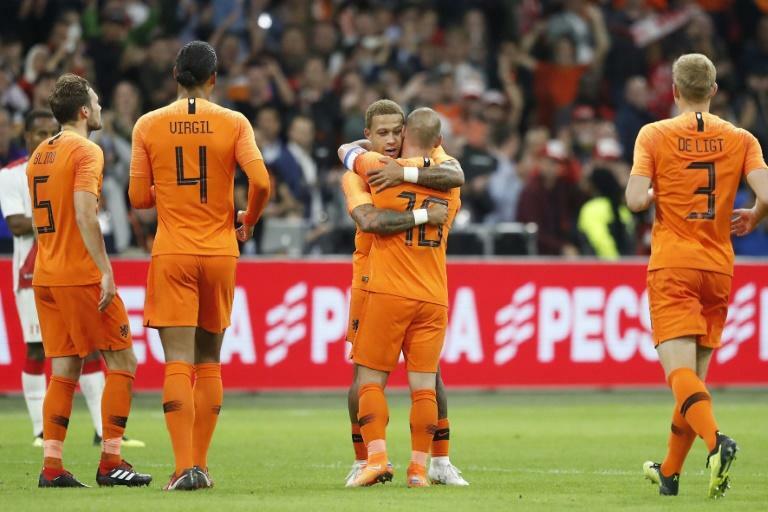 Wesley Sneijder turned out for the Netherlands for the 134th and final time on Thursday as Memphis Depay's brace secured a 2-1 friendly win over Peru in Amsterdam. On an emotional night at the Johan Cruyff Arena, Dutch coach Ronald Koeman handed over the captain's armband to Sneijder, who is now 34. Sneijder, the former Real Madrid and Inter Milan playmaker who moved to Al Gharafa of Qatar earlier this year, took the microphone and encouraged fans to join him for a beer on their way out of the stadium. A star of the Dutch team that got to the 2010 World Cup final, Sneijder received a warm ovation from the 50,000 fans at the home of Ajax, the club where he began his career. The most-capped Dutch player of all time, who won his first cap in 2003, leaves behind a team trying to rebuild after failing to qualiy for Euro 2016 or the last World Cup. Koeman is trying to build a side capable of making it to Euro 2020 built around Liverpool centre-back Virgil van Dijk and also featuring young Ajax starlet Matthijs de Ligt. They fell behind against the Peruvians through a Pedro Aquino goal early on, but Lyon forward Depay equalised on the hour mark before netting the winner seven minutes from time. Koeman later confirmed he would make "several changes" for Sunday's trip to face World Cup winners France in their first match in the new UEFA Nations League.